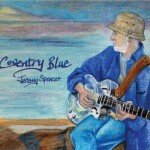 Share the post "Album review: JEREMY SPENCER – Coventry Blue"
‘Coventry Blue’ is Jeremy Spencer’s second record since making an impressive but understated comeback with ‘Bend In The Road’. If the latter was loosely based around the concept of travel, then ‘Coventry Blue’ is more about loyalty, love and relationships played out over a country blues vibe, with the emphasis on an array of slide guitar tones. It also has a more retrospective feel with at least half of the song having their origins in semi completed or refurbished works that in some cases go back 40 years. He evokes both Elvis and Cliff Richard on ‘Blind Lover’ and ‘Endlessly’, though both would have been startled to hear his Hawaiian sounding guitar. Either way, Jeremy has obviously worked painstakingly on his material, even helpfully giving us a diarist’s account of how the songs came about or why in some cases the lyrics that were left out. He’s retained the same group of people who made ‘Bend In The Road’ such a delight. Once again he’s teamed up with Detroit band Saint Cecillia, who feature multi- instrumentalist, guitarist and the album’s co-producer Brett Lucas, bass player James Simonson, and drummer Todd Glass. Rachel May is also given her own lead vocal on the poignant ‘Letting Go Of The Past’, one of the best songs on the album. There’s also a significant role for the string section of Mimi Morris and Stefan Koch who also appeared on ‘Bend In The Road’. ‘Coventry Blue’ is full of drifting ideas, feels, grooves, moments in time and consistently great guitar playing from both Jeremy and Brett, who clearly revel in each other’s company. It’s an organic sounding album that subtly washes over you and leaves lot of good things in its residue. The ‘live in the studio’ feel is evidenced by the voice over intro to the familiar theme of ‘Got To Keep On Moving’, a track that could be the Grateful Dead right down to the Jerry Garcia style vocal, as Jeremy just manages to find his range. It’s a style he repeats on ‘Open the Door’, before being bailed out by bv’s. There’s plenty of feel in his close-to-the-mic phrasing on the phonetic ‘Dearest…Umm, Yah’, the melody of which echoes Buddy Holly’s ‘Hold Me Close’, while the exquisite ‘Send An Angel’ might have been Mark Knopfler, but it’s built round Jeremy’s trademark slide sound. Jeremy tells us the stuttering rhythm of ‘Sounds Like Paris’ – the title is neatly evoked by Duncan McMillan’s accordion – is something he originally worked on in Greece back in ’81. The exquisite slide playing might have sounded better without the filmic strings, as his honey dripping guitar tone conveys more emotion than any lyric, vocal inflection or ambitious arrangement. There’s also a lovely seamless switch from slide to acoustic on a tightly wrought piece, anchored by James Simonson’s double bass. The moments of inspiration and interplay are worth waiting for. Listen for example, to the piano and slide interplay of ‘Sweet Were The Days’ as part of an uplifting melody punctuated by Molly Hughes’s expressive violin. Brett’s drifting piano and Jeremy’s tremulous notes build the song towards its subtle resolution. It’s another big screen song on which the ensemble pushes Jeremy to one of his best recorded moments in recent times. He goes back to his blues roots on the title track duet with Brett, and unravels a beautiful ‘Sleepwalk’ inspired instrumental on the slide-led gem ‘Nightingale’s Pledge’. It’s a track on which he painstakingly researched the title for lyrical inspiration, before wisely letting the melody stand on its own. Jeremy also sparkles on the on the jaunty brush strokes and harmony vocals of ‘Moonshine Slide’, an ode to his guitar, and he shares a delicate harmony guitar duet with Brett on ‘The World In Her Heart’ with distant echoes of ‘Albatross’. This entry was posted in ALBUM REVIEWS, ALBUM REVIEWS (Mobile), All Posts and tagged album, blues, Brett Lucas, Buddy Holly, Cliff Richard, country blues, Coventry Blue, Duncan McMillan, Elvis Presley, Fleetwood Mac, James Simonson, Jeremy Spencer, Mark Knopfler, Mimi Morris, Molly Hughes, Rachel May, review, Saint Cecillia, slide guitar, Stephan Koch, Todd Glass. Bookmark the permalink.